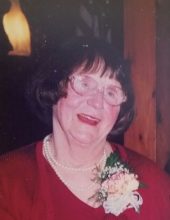 Augusta-Della Pittman, passed peacefully on November 13, 2018, at home with her family. Della was predeceased by husband Abel Pittman. Della was mother to Uriah Pittman and former wife Janice of Tulsa, Oklahoma, James Akins & wife Melody of Madison, NY, Joyce Pittman & husband Bert MacKenzie of Salem, NH, Joseph Pittman and Alan Pittman of Augusta, NY. Della was born in St. John’s Newfoundland, Canada. The daughter of Walter and Dora Webber; sister to Wallace, Joyce and George Webber. Della was raised and spoiled by her Grandparents on Smith Sound, Milton due to her siblings arriving so close in age. Della’s love affair began with Abe in school in Georges Brook. Della went on to work in Moncton, New Brunswick. Abel moved to the US with his family and when he returned from Korea they were married. Della said that the fairy tale continued when Abel brought her to a little cape cod house steps from the beach on Long Island. She wrote her mom that she woke into a dream. Together they moved to Madison, NY, restored and built a few homes before settling in Augusta. Della was foster mother to many children, dogs, cows and rabbits. For more than 25 years Della provided group home care to many residents of Rome Developmental Center and private families. Della was recognized by Central New York, Developmental Services for outstanding service. Della was grandmother to Julie Monnot, Aaron Pittman, Jessica Clark, Jeanette, Jennifer and Jimmy Akins, and Zachary MacKenzie; and great grandmother to Felicity and Michael Monnot, Preston Clark, Spenser Clark, Clayton Ayers, Abagail Ayres, Kaitlyn Akins, Trevor Akins and Ellison Pittman and many nieces, nephews, cousins and in-laws. Della was daughter-in law to Abe’s parents Mildred and Joe Pittman. Della enjoyed an enormous extended family in all directions and was known to say, “just come, the more the merrier”. Della loved and was loved by many. To send flowers or a remembrance gift to the family of Della Pittman, please visit our Tribute Store. Graveside services to follow at Sherburne West Hill Cemetery. "Email Address" would like to share the life celebration of Della Pittman. Click on the "link" to go to share a favorite memory or leave a condolence message for the family.